Steven Hale, a Chartered Scientist from the University of Birmingham has been named overall winner of the #TechniciansMakeitHappen photo competition, celebrating the UK’s 1.5 million technicians. 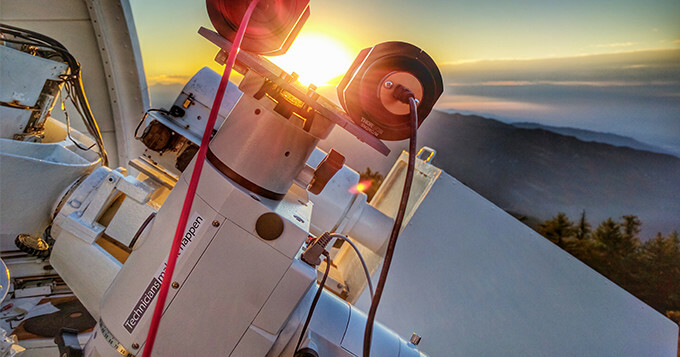 The winning image captures a sunrise over the world-famous Mt Wilson Observatory in Los Angeles. Steven who works on cutting-edge robotic telescopes like the one in his picture will receive £1000, as well as career mentorship from industry experts. The competition was launched last year by The Gatsby Foundation to encourage more young people to consider a career as a technician, as over 70,000 roles go unfilled each year in the UK. More than 300 photos were entered into the competition, showcasing the amazing things technicians build, make and create – from space equipment to sports kits, concerts and cars. The competition was judged earlier this month by an esteemed panel, including Jez Brooks at tech giant IBM and photographer Leonora Saunders, whose work has featured in national publications like the Guardian and The Sunday Times. “This competition has been an excellent opportunity to showcase the breadth of fascinating, intriguing – and even beautiful things that technicians make happen. As part of the campaign, more than 25 industry leaders have pledged their support including the BBC, Royal Air Force, Mercedes AMG and Siemens. Compelling case studies, photographs and artefacts are touring the UK to inspire the next generation. To find out more, visit www.technicians.org.uk.